Extremely short product lifecycles and product development cycles. Consider the simple example of a cell phone: By the time the latest model hits store shelves, the market is already moving forward with higher quality products. Thus, electronics original equipment manufacturers (OEMs) must constantly revamp their processes and source new materials just to keep up with their competitors. There's no such thing as a cash cow product line or consistent workflow this industry. Strict quality standards. Just about every product on the market today includes some form of electronics that are essential for its operation. If a product’s electrical systems fail, the consequences could be severe, especially with medical equipment or an automobile. Defective products can be devastating for the manufacturer responsible, leading to steep legal costs and damaged brand reputation. Regulatory compliance throughout the supply chain. Electronics OEMs must achieve compliance for Underwriters Laboratory (UL) and their own manufacturing processes. They must also meet guidelines for chemicals and materials handling and disposal. This gets even more complex when the OEM must also ensure that every vendor and supplier throughout the supply chain also meets the same standards. Thin profit margins. The electronics market is very crowded, and as the cost of final products continues to fall, margins will only get thinner. 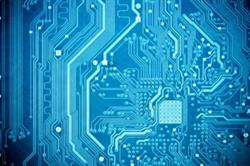 Improving operational and supply chain efficiencies is a must for electronics manufacturers. With such thin margins, electronics OEMs may be tempted to go for the cheapest component part vendors possible. Strict regulatory standards and customer demand for higher quality products, however, have made it so OEMs have to be more judicious with their supply chain partners. If a specific vendor is not accepted by a local regulatory agency, the company will have to seek another one. An ERP system allows electronics companies to create and manage vendor approval lists with compliance documentation for each vendor. These lists are easy to edit, which is essential in an ever-changing regulatory environment where a vendor can fall out of compliance quickly, forcing the electronics OEM to find a new, approved one as soon as possible. Electronics OEMs have vendors and supply chain partners all over the world. Without a real-time means of communication, OEMs and vendors will not be able to move quickly enough to handle the pressure from retailers and end users to bring products to market. A good ERP solution will have a web-based supplier portal, which allows all vendors to see the orders being placed in real time. This functionality allows electronics OEMs to let their vendors know in advance when a future order will be placed so they can begin preparing the order ahead of time. Lean manufacturing is the dominant paradigm in electronics manufacturing, and a good ERP system will be able to facilitate it. Building on the last point, most electronics OEMs today have moved to a lean manufacturing business model. This is a demand-driven model in which manufacturers schedule production runs only when a customer places an order. Because the rate of technological change is so rapid in this sector, the lean model mitigates losses that come with holding inventory past the point of obsolescence. ERP systems can automate much of the production process, from scheduling to inventory control to vendor communications. This is essential for lean manufacturing because it removes the friction that can occur when handling these processes manually or through siloed spreadsheets. With such rigorous regulatory structures and customer demands, product integrity is critical. If there is a defect in any product, the manufacturer must be able to find it and trace it back through the production process to see where it came from, who handled it and who ended up with the finished goods. For both vendors and OEMs, lot control and traceability is a must-have. For example, in printed circuit board assembly, there could be thousands of individual components on a single board. One failed component could ruin the product. A good ERP system should expedite lot control by making it easy for users to locate a specific lot and trace it through the whole production process. Electronics OEMs need to be able to measure and track defects throughout production. The ERP system should be able to make note of failures, reasons for failures, and overarching trends - is it a specific vendor, a certain material or a part of the process that is causing a defect? Quality control starts from the beginning -- from the shipment of component parts to the final delivery to the customer. Electronics OEMs have to process data regarding nonconforming parts in real time and get results so they can correct the problem as soon as possible. Downtime in a high-volume environment can be devastating. Real-time defect analysis and quarantining must be within the capabilities of the ERP system.